When I temporarily relocated to Nashville I gave myself permission to buy two necessary luxuries -- speakers for my iPod and a portable yoga floor. The latter arrived last week, an entire month after I'd ordered it. I assume this is because they were busy "handcrafting" the "imported hardwood" and then buffing it to its "fine gloss finish." In any case, it is now here and I'm pretty excited about it. At home in the C-U I have a linoleum floor for yoga, but here I'm in a carpeted apartment. Doing yoga on carpet is almost impossible. 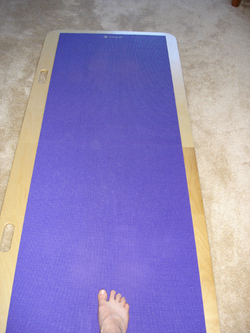 Doing yoga on a sticky mat placed on a carpet is just annoying. Doing yoga on my very large kitchen floor seemed like it might work, until I whacked my ankle bone on the kitchen counter while doing ardha chandrasana. Hence, the need for the yoga floor. Despite the well-deserved litany of positive feedback featured on the company web site, I do have one complaint. The "fine gloss finish" that makes the yoga floor so pretty also makes it slippery. I like to do standing poses without a yoga mat sometimes, but that's impossible on the yoga floor because my feet have no grip. I can live with that, but a bigger problem is that regardless of whether I'm using the mat or not, the entire floor slips on the carpet -- which means that jumping and certain inversions are out of the question unless I am very, very careful. Even a shift of the legs in a standing pose can cause the whole apparatus to shift a couple of inches on the carpet. My beloved suggested what I think is the perfect solution: buy some of the non-skid stuff you put underneath rugs to keep them from slipping and put it underneath the yoga floor. I will test this and I bet it will work great. The irony of this solution, of course, is that it means that my yoga floor needs its own sticky mat.